Why Do Foreigners Bail On ESL Contracts? Korea is haven for English speakers looking to escape the borders of their homelands and try working in a foreign land. Why? For one, it is one of the only countries to pay for instructors’ tickets going in and out. Second, like Taiwan, the salary is absurdly high given the cost of living. Around 2.0-2.2 million Won/month. Someone could live off less than half that if he was frugal enough. It should come as no surprise that many employers hire recruiters to gather foreigners from around the world… some of whom enter the country, and drop completely off the radar. My current boss, a legitimate businessman and a nice guy, has been cheated a number of times. He’s attributes this to his previous recruiting agency. One time a teacher stayed for three months, then said he couldn’t take it. Another time, and I find this to be the standard, a Canadian was recruited to teach for a year. He arrived in Seoul without incident, caught the bus all the way to the school… then once he was settled in the apartment, left without a word. The police were able to catch him on a bus back to Seoul, but plenty of times, the teachers just vanish. Immigration doesn’t always know to look for them on the way out, or they just stay here for a while. Why are so many waygooks (foreigners in Korean) tempted to do this? Take advantage of a system which needs them to educate young people? It’s not limited to Korea: Japan, China, Thailand, probably South America and Africa too, but I can’t speak for those continents. This is a business and you need to understand that you teach when we have students. That’s all. The contract was a mistake. Capish? Then what is the value of the contract? It is to get you your visa. So many innocent college graduates come over to Asia, thinking high pay and little responsibility. Some of them find a good school, a good manager by chance. Others discover they are “required” to work more hours than agreed upon in the contract, cannot take days off, and have strange expenses deducted from their salary. Why do they allow this to happen? I’m not saying employers are right to get all the work out of you that they can. However, there are better solutions than throwing a fit, creating so uncomfortable an work environment one feels he has to leave the country early. Ask teachers who have been successful in voicing them opinions on this matter. Research legal precedent, and see if you can use it as leverage. Depending on your manager, try to speak to them outside of the office over drinks; in many cultures, anything said while drinking is excusable, which is why many foreigners and locals alike in Asia choose to get hammered after work. Simple math, in any kind of financial situation. If you’re dealing with a company willing to fly you over, sponsor your visa, and set you up in temporary housing, why stick around if you find working conditions less than ideal? I’m certainly not advocating it, just going over the logic others surely use to justify their actions. You’re in a foreign country on another’s dime, and it seems unlikely they’ll catch you if you flee. I’ve certainly never heard of someone being stopped at immigration or being extradited for bailing on an English-teaching contract. Immaturity is more like it. Teaching English to little kids sounds so easy, so simple from far away in time and space, but any teacher will tell you: it’s the younger kids who are the most difficult, who need the most structure. In any culture. If you’re not terrified the first time you see those little eyes staring at you, expecting you to take point, there’s something wrong with your teaching style. You will screw up. You will get frustrated. Some just can’t handle it, so they bail. Even if the job is going relatively well, there’s still the issue of being a stranger in a strange land. You’re living over here, not just visiting, and after a few months, it stops feeling like a vacation and turns into your life. Maybe it’s not what you want it to be. 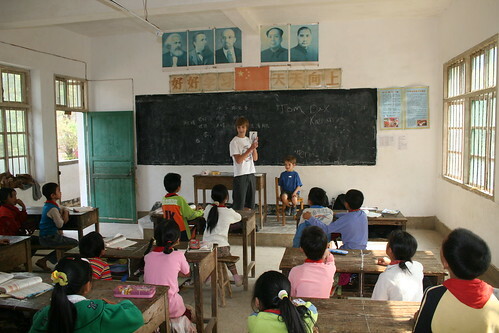 In general, teachers get about 2000USD a month in Japan, Korea, Thailand, and Taiwan. About half of that in China and Thailand. Plenty to live on comfortably in your country of choice, but what if something goes wrong? Again, it comes back to the contract. Teachers being “asked” to work overtime, and not being paid for it. Late paychecks. Deductions for bad behavior (at the discretion of the employer). If your boss says “sorry, we can’t pay you this month”, what are you supposed to do? Who do you tell? The police? File a lawsuit? The company knows its power, and knows your dependence on them. They know you’ll have little choice but to cave to their demands. Some just take themselves out of the equation. He’s gotten frustrated about being locked into a contract in a foreign country early on, and everything just fuels his anger, which he doesn’t hesitate to show to locals, foreigners, and little kids. Teaching is the first step. Now that he’s in Asia, he’ll be learning the language and applying to different companies. Teaching is a means to an end. Spends his weekends climbing mountains and bedding the natives. Always looking to get out of the apartment. Yep, there’s just one type. Someone who wants to teach just for the sake of teaching. He or she makes lesson plans. Cares about students’ progress. Puts his or her own money into supplies and props. Has no problem coming in early, working late, or being called on days off. This is the one employers should be able to find, but I doubt they do for more than 1 in 10 applicants. The list goes on, but the point is, everyone has their own reasons for wanting to live and work abroad. With as many people that do apply, you would think recruiters could actually do some screening. I’m the adventurer. I teach as a means to an end (namely, to get into the country), and my boss really doesn’t have a problem with that, as long as I do an adequate job. I’m hardly extending myself. For someone career-minded, I could completely understand them bailing as soon as they found something better. The malcontent should never have made it past the first interview… but they do, somehow. The sword cuts both ways. Employers know they have a long list of teachers waiting to come in, not including English speakers in-country who would be willing to substitute while a new instructor is found. They can fire you with a day or a week’s notice (check your contract! ), and bring in the second string. By the same token, you can quit and just vanish. Both parties know this, and when tension or fear arises, both consider just how much they’re willing to put up with.